Eleven years ago, South African-born dancer/choreographer Steven Cohen and his partner Elu created a piece called Dancing With Nothing but Heart. Debuting on the Dance Umbrella of 2003, it featured a naked Elu dancing with an enormous ox heart in his arms. No costumes. No soundtrack. No lighting. Just heart. The press material came with the warning that full frontal poverty was part of the gig and that it aimed to be offensive. It was a gesture made in the absence of dance funding. An issue which hasn’t gone away. Mari-Louise Basson Angelier, a Johannesburg-educated dancer, currently living in Marseilles, France, last month did something similar in Johannesburg, and while the aesthetics of her distinctive approach may be more consciously polished, the issue she raised echoed that of Cohen’s. Two racks of fresh meat were hung from the ceiling of the Dance Factory in La Morte d’Une Fleur (A Dying Protea) and a dish of potatoes with a knife was situated on the floor. And then there was the rope. Sisal rather than silk, an aesthetic prerequisite of aerial dancing, it hung from the reaches of the ceiling. The work was backgrounded by sounds of violence, of media dialogue, of snatches of Philip Glass material. The muscularity of Angelier’s performance in this work, which enjoyed a brief, self-funded season at the Dance Factory and appeared in a different manifestation at a tribute to choreographer Vicki Karras a few weeks later, belied the smallness of her physique. At once she embraces the whole stage with the fearsome drama of her approach, governed as it is by beauty, and its corollary: violence. The passion she articulates with her sinews, bones and muscles is caught within the parameters of her small frame, clad as it is in a brief black leotard which she complements with leggings once the rope becomes part of the piece. While she explains that the meat and potatoes, which she peels at one point, reflect an acknowledgment of African funereal culture, this doesn’t resonate as such in the work. Rather, the gesture has a presence of its own and the intimacy of holding a potato in one hand and separating the flesh from the skin with a blade in the other takes on a monumentality that is almost frightening in its vague yet direct reflections. 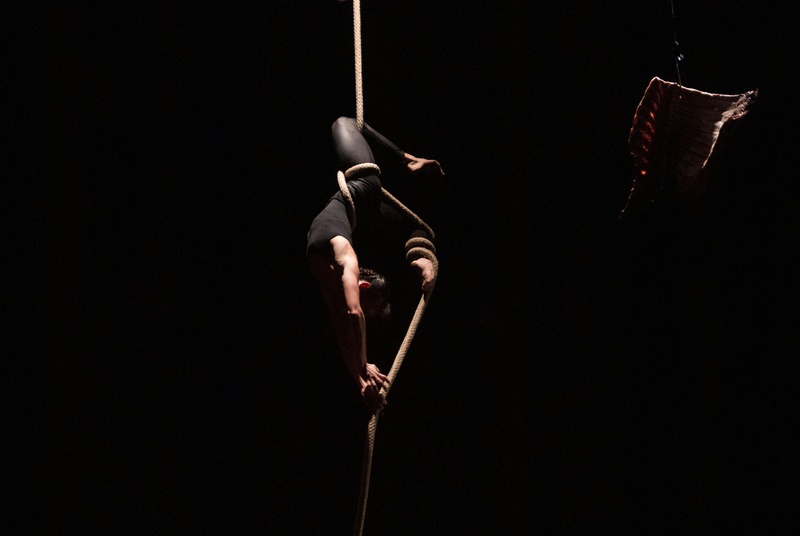 In the Vicki Karras tribute show, this element of the work was absent; allowing you in the audience to feel your heart and soul soar as the dancer defies gravity with much gravitas, twisting and coiling her body with the rope: it’s harsh, it’s direct and it’s in your face. The work is a comment on the moribund nature of the dance fraternity and was beautiful cloven to the idea of creating a season of performance out of nothing. Resting on nothing but the desire to make work, La Morte d’Une Fleur was simply searing.